Inventory We are a resale marketplace, not a box office or venue. Ticket prices may exceed face value. This site is not owned by Cadillac Palace Theater . The Cadillac Palace Theatre Chicago originally opened in 1926 under the name the New Palace Theatre. 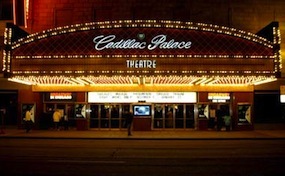 The 2,344 seating capacity venue was renamed the Cadillac Palace Theatre in 1999. The Cadillac Theatre Box Office offers some of the finest traveling shows located conveniently at 151 West Randolph Street right in downtown Chicago. Cadillac Palace Theater tickets have included smash broadway hits like Wicked, Jersey Boys, Lion King, the Producers, and Les Miserables. PalaceTheatreChicago.com is in no way affiliated with any official box office or official website. We proudly offer secondary market tickets from the number one independently owned and operated site in the industry. To order tickets online for all Cadillac Palace Chicago events simply follow the steps online through the checkout.